Our ePay and eStatements have a fresh new look! Community Financial’s eStatements help simplify your life and are a great way to go green. Instead of receiving your statements in the mail every month, you’ll get an email stating that your statements and loan notices are ready for viewing online at your convenience. Your eStatements are available through our secured Online Banking services, eBanking. They’re in PDF format which lets you view, print, and download them to your home computer. With a click of your mouse you have access to past statements whenever you need them. 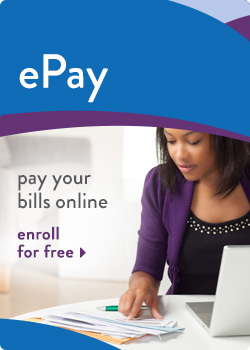 When you enroll in eStatements, you will also receive account information electronically by eNotices. The next time you are in the branch tell the representative you’d like eReceipts too. Community Financial will send you an email when new statements, notices or receipts are available for viewing. Going paperless at Community Financial is so easy! Are eStatements right for you? Login to eBanking and click on the eStatements tab. Then you’ll be asked for your email address and to accept the eStatement terms. You’ll be enjoying this free & easy service in no time! If you need assistance setting up eBanking, please call our Member Service Center or visit any branch.